← Board 2 Pieces October 11, 2012: Essen Preview: Bumm Bumm Ballon! Despite the obvious attractiveness of the theme, the superhero genre has always had a difficult time succeeding, both in boardgames as well as video games. Gamers’ expectations always run high and games tend to either disappoint by providing too narrow a spectrum of hero abilities or fail by providing such a wealth of choices that the game must necessarily be over-complicated. 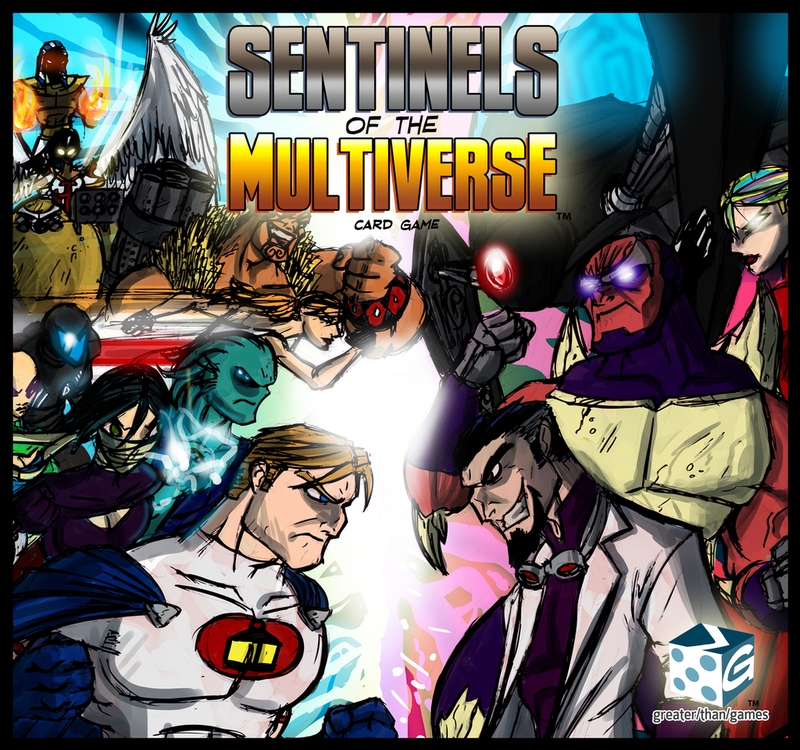 The recent card game entry, Sentinels of the Multiverse, (see the previous Opinionated Gamers review) overcomes some of the complexity issues by providing prebuilt decks of cards for each superhero. This places special rules or behaviors for each hero into their cards rather than having a cluttered rulebook. 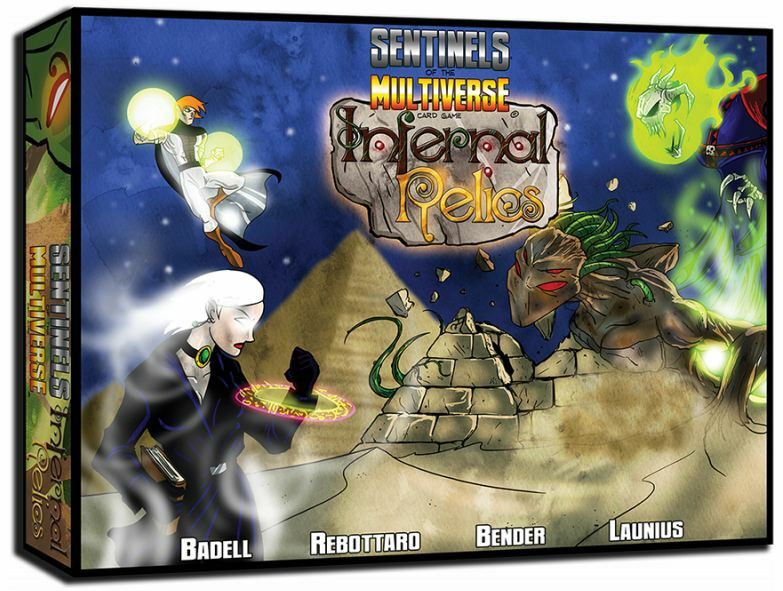 Sentinels also overcomes the problem of having heroes in direct conflict by making it a cooperative game with players all attempting to defeat a central villain. Having had success (particularly in my gaming circles) with their initial run, the folks at Greater Than Games have produced a new Enhanced Edition of the base game along with two new expansions that bring new villains, environments, and a couple heroes to the mix. For rules details, see the aforementioned review, but here’s a quick overview for anyone coming late to the party. Each player has a deck of cards representing their particular superhero. At the game start a villain deck and an environment deck (representing the location of the battle) is chosen. In one round, the villain will take their turn (activating effects and playing a card from the villain deck) followed by each of the heroes. The round ends with the environment deck playing a card and performing effects which can help or hurt the heroes in their efforts. (More often than not, it damages or limits something’s abilities although that something might not always be a hero.) Players, villains, and some other cards (in any of the decks) have hit points and are legal targets for attacks. Players try to attack the villain and its minions while the villain and its cards primarily attack the heroes. Typically, if enough damage is done to the villain, his or her card “flips” to a new, slightly more powerful side and the battle continues. If this side is also defeated, the heroes win. If all the heroes are defeated, the villain wins. Note that even if a hero goes to 0 HP, that player is still allowed to participate in the game via minor actions they can do (depending on their hero) on their turns after they are eliminated. A player’s turn consists primarily of playing a card, using a power, and then ending the turn by drawing a new card. Each hero starts with a very basic power to activate, but as the game progresses cards can be played that offer different powers to use and/or upgrades to existing powers. This is the meat of the game. Within a hero deck there are synergies to be exploited as well as between hero decks. For example, in the base game there is a villain whose sole power starts out as the ability to damage himself with 1 point of fire damage or 1 point of cold damage. While this is truly a lame superhero, as the game progresses, that character can play cards to gain the ability to damage other cards whenever he takes fire damage, and heal himself whenever he takes cold damage. Thus, the ability to damage himself can become quite useful if the correct cards are out. Some heros focus on doing lots of damage, others excel at damaging many targets, and still others tend to be better at empowering and improving their fellow heroes. There is a lot going on in the game, perhaps overwhelmingly so at first to anyone unfamiliar with more complex synergistic card games like Magic: the Gathering. However, I see this as a partial strength of the game. It helps to prevent the classic cooperative game blunder of a single player making everyone else’s turn, and also provides depth of play for gamers to explore new pairings of abilities. The game can be a bit unbalanced at times with unlucky card draws in the villain or environment decks, but as with all card games things tend to even out in the end. 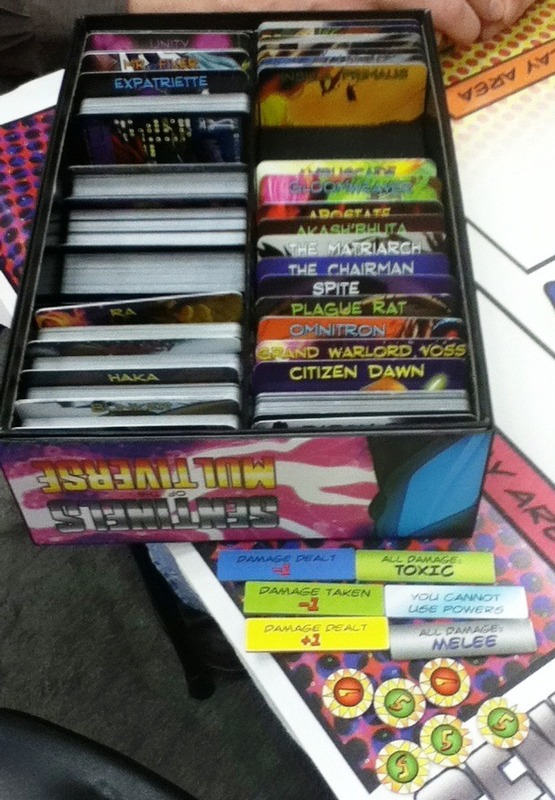 Fans of superhero games, cooperative games, or more complex and synergistic card games should find something to enjoy here. The new enhanced edition is leaps and bounds a better presentation of the game than the previous small box edition. The new box is sturdier and a far better storage method. Similar to AEG’s boxes for Thunderstone or Nightfall, the new box has two rows for card storage and provides nice graphic dividers for keeping the various card decks separate. There are even dividers provided for all the expansion cards. The cards themselves are on slightly better card stock (I find them good, but not the highest end available) and there are cardboard tokens provided to help keep track of damage and game effects. The damage tokens are a godsend (you had to make do with pencil and paper or whatever you had on hand before) and the game effect tokens do help considerably to manage the many complexities that interacting heroes and villains can create. The Enhanced Edition is clearly the preferred edition to purchase for new players (if you even can find the old version around), but fans who have the previous game can buy just the box, dividers, and tokens as an “upgrade” set to give themselves a much better storage situation as well as the handy tokens. The second expansion, Infernal Relics, has a Cthulhu / Demonic theme with a spell caster and a mystical bard/musician. Villains include a huge nature aspect, a relic hunter, a zombie king, and even a supervillain team of Egyptian gods. There are fewer new global mechanics in this second expansion, but most of the new stuff is found within the way individual hero and villain decks operate. Both expansions are a no-brainer purchase for fans of the game, and I’m hard pressed to pick one favorite over the other. Infernal Relics has slightly more interesting (and different) hero mechanics than Rook City, but both expansions’ villains introduce quite different game experiences. For those who just love spoilers (or who want to pick and choose an expansion), here is a list of the heroes, villains, and environment decks of the two expansions. Mr. Fixer is an old mechanic turned martial artist who uses tools (equipment) and styles (a type of ongoing card) in order to do irreducible damage, redirect damage, or simply do extra damage. Expatriette is a gun specialist who has both guns (equipment cards) as well as ammo cards which modify (for a single use) the abilities of her gun cards. These most often are able to increase and modify the damage type performed by her guns. Plague Rat does a small amount of irreducible damage and infects the heroes. Infected heroes deal damage to themselves and sometimes others. Plague Rat incrases in power as more heroes become infected. The Chairman is a stereotypical crime boss. You can’t even identify (and damage him) until you first take out his right-hand “man” The Operative. Thus it becomes two medium-sized villains for the price of one. In addition, The Chairman has a deck of low power thugs, and medium strength Underbosses which have unique powers and can be recalled back into play. Spite the mutant drug-crazed serial killer is perhaps the strangest villain in the set. He has (indestructible) drug cards which improve his powers, and a safe house card players use to squirrel away “victims” from Spite’s clutches. When Spite flips to his his “drug-wracked monstrosity” side and victims thus hidden away will deal a one-time burst of major damage to Spite. 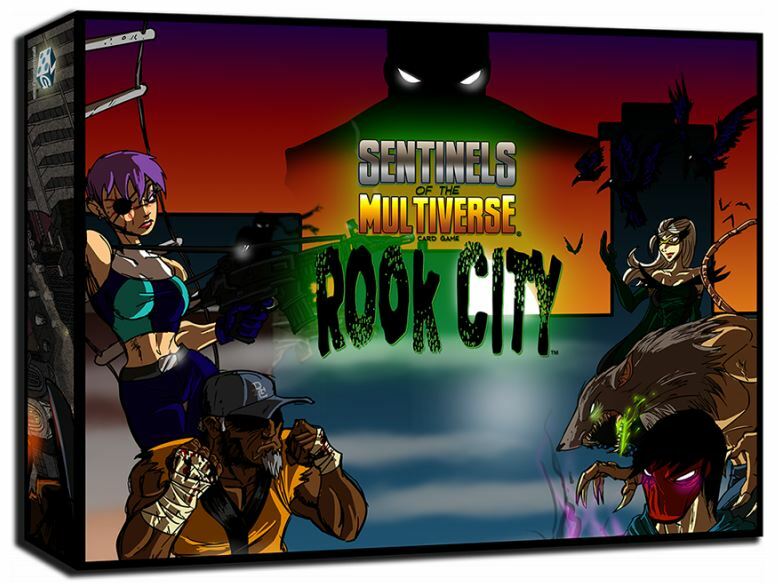 Rook City – yes you can fight on the streets of the city itself. This deck typically messes with itself and the villain deck and has a healthy dose of NPC cards that wander into play to change things up. Pike Industrial Complex has many chemical Vat cards that stack up and affect the game play. If they are left lying around too long, they can explode and do serious damage. There are rat cards that gang up on low HP non-environment targets and can all be brought back from the environment discards. Nightmist is an occult practitioner who casts spells. All her cards have a spell icon containing a number. Many of her powers and abilities key off this number for damage or healing effects. She has a high number of cards that cause herself damage but also some the can be used for self-healing. Argent Adept is a mystic musician who uses Instruments (equipment cards) to use ongoing abilities that must be activated. These abilities consist of three types: Melodies, Harmonies, and Rhythm. The Argent Adept can even use his powers to activate multiple abilities at once. The deck specializes in many healing options as well as ways to assist other heroes with card management, attacks, and defenses. Akash’Bhuta is a huge aspect of nature that isn’t all that damaging, but has a HUGE number of hitpoints (200, twice the previous “big guy”). Hopefully that doesn’t translate into a much longer game. Akash’Bhuta interacts with environment cards so will probably vary quite a bit with the environment deck chosen. Apostate has a number of very powerful relic cards that enhance him and are sacrificed if he is about to be defeated. GloomWeaver also has a few relic cards, but they have a high number of hit points. However, if the players can destroy them early they automatically win. GloomWeaver also has five zombie cards that just don’t want to stay in the trash and keep coming back. The Tomb of Anubis has a plethora of minion-type cards as well as Trial cards which are ongoing and challenge the players. There is also a powerful recurring NPC that must be repeatedly beaten down. Realm of Discord has several Distortion cards that can only be in play one at a time. They significantly change how the game is played by giving players and villains bonus cards, cause damage increases, and even limit abilities that can be used. Mike Siggins: I still think this is one of the most original and better designed games of the last couple of years. I have found it a little difficult to keep up with enhancements once it went off into The Land of Kickstarting, but frankly the base game has plenty of mileage. Still, today I ordered Infernal Relics and look forward to further games.